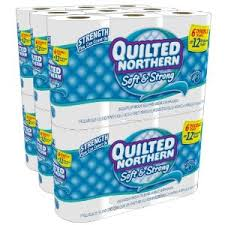 Right now, Amazon has Quilted Northern Ultra Soft and Strong Toilet Paper, 36 Double Rolls for $15.35 when you click on Subscribe & Save on the right side and clip the $1.25 off coupon below the photo. Plus, it’s shipped for FREE right to your door! Since 36 double rolls equals 72 single rolls, you are only paying $0.21 per single roll, which is a great price for quality toilet paper! Amazon prices can change at any time, so if you like this deal, then order it now. And once your order arrives, then you can cancel future shipments of this product by logging into you Amazon account and going into Manage Subscribe & Save.